Born in 1936, in a small camp on the Nauligaqvik River. Elijassiapik’s carvings from the late 1960s are moderate in size, round, and usually depict fish or birds. He also accentuated his larger figurative sculptures’ elliptical-shaped eyes with ivory or bone inlay. 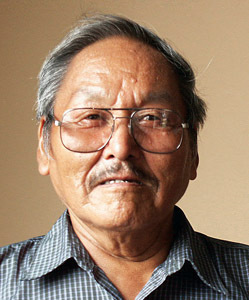 Elijassiapik was President of the Inukjuak Community Council for many years, and served on the board of directors of La Fédération Coopératives du Nouveau-Québec. 2006 “Metamorphosis: Eleven Artists from Nunavik,” Inuit Art Quarterly (IAQ), vol. 21, no. 3 (Fall): 33.